(P1) Diet Coke fans may soon be seeing red. That’s because, as BuzzFeed reports, Coca-Cola is redesigning its bottles and cans to make “Coca-Cola Red,” the color most associated with Original Coke, more prominent for Diet Coke, Coke Zero, and whatever Coke Life is. 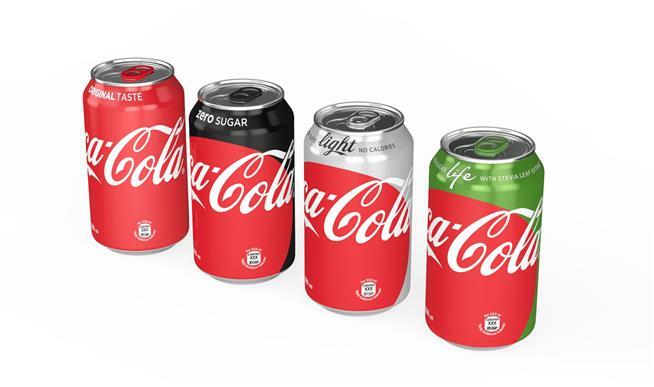 For example, the new Diet Coke can will feature a large red circle with only an accent of its traditional silver. According to the AP, the “One Brand” strategy has been tested in Chile, Russia, and Spain and will officially debut this May in Mexico with additional country rollouts through 2017. However, Coca-Cola is still gauging customer response to the redesign in the US. (P2) In years past, Coca-Cola has separated its flavors as much as possible in order to not “dilute the brand,” Business Insider reports. But with soda sales dropping—especially in the case of Diet Coke—that’s no longer the case. “We’re extending the strong brand equity of Coca-Cola across the trademark to … better promote our great-tasting diet and light portfolio,” BuzzFeed quotes Coke’s CEO as saying. Coca-Cola executives also claimed the redesign would give customers “more choice” while “making it even easier for consumers to choose their Coca-Cola.” It’s unclear how either of those statements is true, but as long as they aren’t pulling a New Coke with the formula again, everything will probably be fine. Do you drink Coca-Cola products? If so, which ones? If not, do you drink another brand? Do you like the new design of the cans? Why or why not? Should Coca-Cola stay with the current design? Why or why not? In your opinion, why are soft drinks so popular to drink? IS 3D PRINTING JUST A FAD?